Adagio, our beloved trimaran, was designed and built by Meade and Jan Gougeon in 1969 and launched in the summer of 1970. After undergoing a minor refit this past winter, she still has what it takes to win. 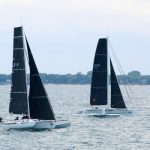 We’re extremely proud that Adagio placed first in the multihull division of 2016 Bell’s Beer Bayview Mackinac Race, which spans almost 300 miles of often treacherous Great Lakes. 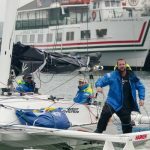 This year’s race was fast, with Adagio finishing in just over 29 hours. 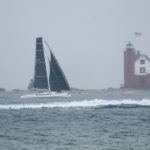 The fleet had a beautiful, mostly downwind run to the Cove Island buoy and then a thrilling reach most of the way to Mackinac Island. 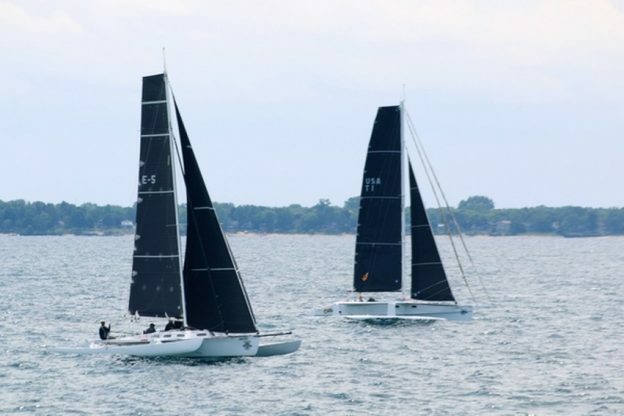 Of course, Lake Huron had to throw 35-knot winds, rapidly shifting direction, at us about 40 miles from the finish line, but Adagio continued strong. This was the fifth time Adagio took first place in this venerable race, having won the open class in 1999, 2000, 2002 and 2006. Adagio leading the pack at the start of the race. 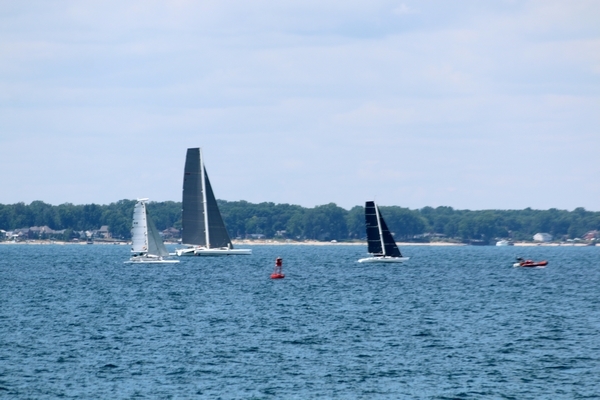 Strings, another Gougeon built boat, shown in third would finish second in the multihull division. During the winter we prepared for the race by modifying the spinnaker pole, replacing most of her hardware, improving the deck layout for speed and simplicity, optimizing sheeting locations and putting on a gorgeous set of North Sails. We performed some minor repairs and maintenance to the hulls, but did almost no structural work other than extending the cabin top 12″ to gain sheeting angle. 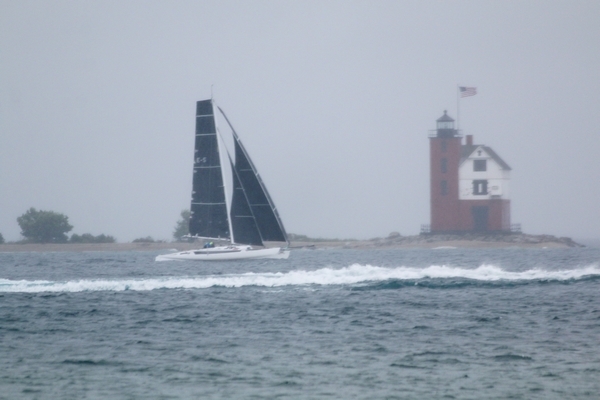 Heavy winds and rain as Adagio passes Round Island Lighthouse to finish the race first in the multihull division. In many ways, Adagio is a testament to wood/epoxy boat building. To our knowledge, she was the first large wooden boat bonded together entirely with epoxy and using no permanent mechanical fasteners. She was also the first wooden boat completely sealed with epoxy both inside and out for moisture exclusion. This winter, we plan to replace the original centerboard case which has provided 47 years of service. Considering what she’s been asked to do over the last half-century, I’d say Adagio’s longevity has been quite amazing. With proper care, maintenance, and a little luck, she’ll be leading future generations of Gougeon’s across the finish line. 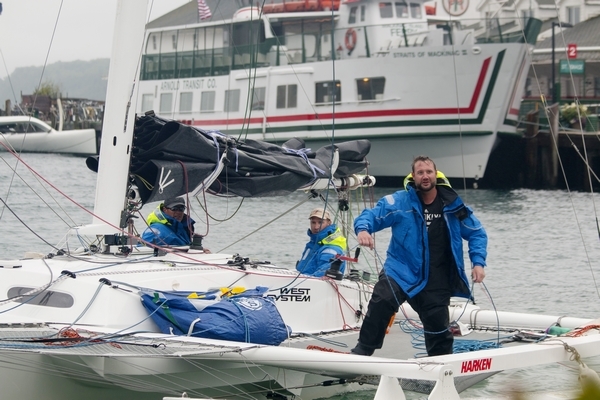 (L to R) Alan Gurski, Matt Scharl and Ben Gougeon crewed Adagio to victory in the Division III, Cove Island Multihull fleet of the 2016 Bell’s Beer Bayview Mackinac Race. Adagio tuning up before the start of the race. 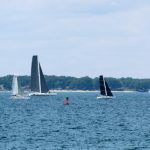 This entry was posted in Multihull Construction and tagged #43, Adagio, Ben Gougeon, Epoxyworks #43, Fall 2016, sailing, Trimaran on August 21, 2016 by ewadmin.